Today was uphill all day. 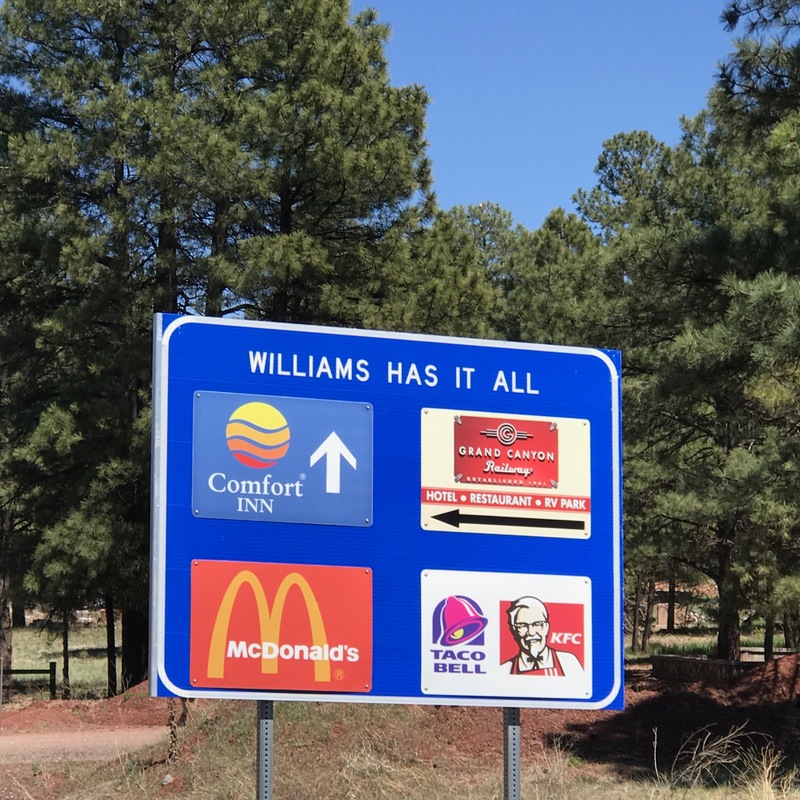 Up, up, up, from Ash Fork to Williams, Arizona. Just a long, slow climb of almost 18 miles, much of it against a headwind. I started at 6:20 am and reached Motel 6 in Williams at 2 pm. Williams is a nice town, and I walked through some of it. I don’t know why some towns seemed to have survived the Route 66 to I-40 transition better than others, but it probably has to do with proximity to the new highway and other geographical and/or demographic factors. There’s a large Safeway, so obviously the town can support a real grocery store. As I climbed, I listened to the Pepper Adams Hollywood Quintet (he was one of the premier jazz baritone saxophonists) and Count Basie’s band (the Count maybe plays 10 notes during each tune, but his band is great!). When you’re walking on the Interstate, you see a wide variety of roadkill. In the last two days I’ve encountered a large owl, jack rabbits, some kind of wild pig (later identified as a peccary), and today a large deer (no antlers). Up close it’s creepier than when you drive by it. The sun was bright all day, and it’s the first time I’ve walked all day on the Interstate. But it won’t be the last. I’m headed to Bellemont tomorrow night, and then Flagstaff. I have a strong feeling I’m going to be visiting many more cities mentioned in the Route 66 song before I head north toward Cincinnati. Now it’s time to head out for some dinner. I don’t seem to be gaining any weight at this point in spite of the fact that I eat (and drink) all day long. Tonight I had a great meal at El Corral restaurant and got to speak few sentences in Spanish to the family members who own it.